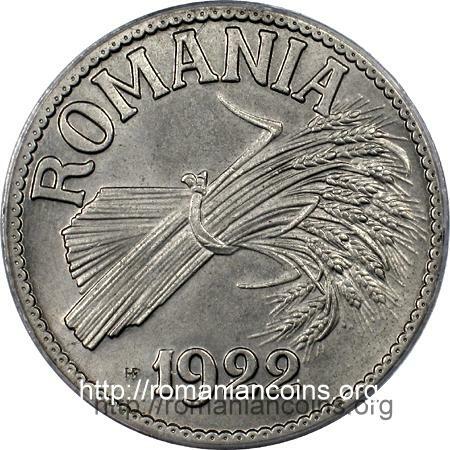 face value "5 LEI", crown and wheat ear outer pearl circle, ROMANIA, year 1922 and wheat sheaf, monogram HF from Huguenin Frères & Co.
Romanian numismatics knows lots of monetary essays and patterns, many of them being presented inside monograph Monede şi bancnote româneşti by George Buzdugan, Octavian Luchian and Constantin Oprescu (1977). For the reign of king Ferdinand, many numismatic essays are known , (more numerous than the coins that actually entered circulation), all with beautiful designs. Exceptionally, the mintage figures for this particular type of pattern are known. 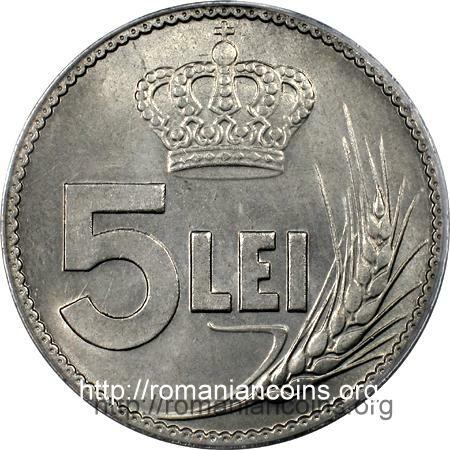 In a paper named "Unele date noi privind proiectele şi probele monetare executate pentru România de casa de medalii Huguenin-Frères din Elveţia" (Some Data Regarding Projects and Coin Proofs Struck for Romania by the Huguenin Frères Le Locle House from Switzerland, written by Constanţa Ştirbu and Katiuşa Pârvan, published in Acta Moldaviae Meridionalis - Annual of the "Ştefan cel Mare" County Museum of Vaslui, XII-XIV, 1990-1992, p. 419-430), a table was published comprising the mintage figures of the essays and patterns struck at Huguenin for Romania (the original documents from Huguenin Frères & Co., filled in 1924 or later, having been obtained by Mr. Bogdan Stambuliu, numismatist from Geneva). In conformity with the forementioned table, patterns for 5 lei 1922 were struck using diffent alloys, namely: 34 from nickel, 41 from cupronickel, 43 from bronze, 47 from aluminum bronze, 44 from copper, 50 from tombac, 43 from brass and 53 from an alloy named "thuna" in French (probably the commercial name of an aluminum alloy - the name comes probably from the Swiss city of Thun, where an important metalurgical plant has functioned at that time).